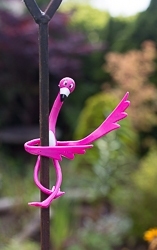 Cute, bendable pink flamingo plant ties wrap around plant stems or other structures. Use to keep plants tidy or in the garden for added decoration. Approx. 7" tall. Comes on carded two pack.